I like the idea of toasting the buckwheat and then milling. Did you get to taste the bread yet? Wonder if you can taste the toasted flavor. The buckwheat does have a tendency to soak up water so probably couldn't hurt to up your hydration slightly. Meanwhile I was mixing up a dough last night and put the mashed potatoes I was going to add in the refrigerator to cool off a bit. Well before I went to bed my wife asks me what the bowl of mush in the refrigerator was.......well no potatoes in this bake unfortunately! Must have been all the fresh air I got yesterday. We finally had a nice spring day hitting almost 60 F.
I was soaking. I should have also toasted the Groats used for the flour. I’ll have to remember that next time. No I haven’t cut into it yet but I know from past experience that the toasting of buckwheat changes the flavour. Its too bad about the potatoes! Reminds me of when we slave over a meal and forget part of it in the fridge! Oh yeah. I celebrated the passing of the season of Winter Crumb yesterday with a very satisfying bake and lay awake this morning (insomnia = ever my muse) composing a TFL post about how seasons seem to affect home baking more than professional baking where they can't afford to not control the bakery environment, Chad Robertson's charming and instructive anecdote in Tartine Bread notwithstanding, about rescuing a batch from SF's fickle weather. But that's probably as much of those thoughts as I'm going to get around to posting. Probably. Maybe after lunching on that bread today I'll be re-inspired. The lesson here is that our doughs are more sensitive to the kitchen's environment than we are. Those bugs (and their ancestors) wouldn't have dodged extinction for 3.5 billion years if they weren't keenly atuned to their environment. Just because we ward off a household chill with extra layers (clothes, not fat :-) doesn't mean the bugs feel any different. They were singing here yesterday on our first 70˚F day in a while. Nice baking as always Danni. I hadn't heard of Daybreak Mills before your post so I looked at their site. Do they charge much for delivery and do you buy most of your basic unbleached bread flour from them too? I'm thinking of trying someone other than Arva for my next flour order. And I'm debating getting an in-home mill too. Your comment on temps made me think of my proofer. Someone posted a sale on brod&taylor proofers last fall so I bought one. 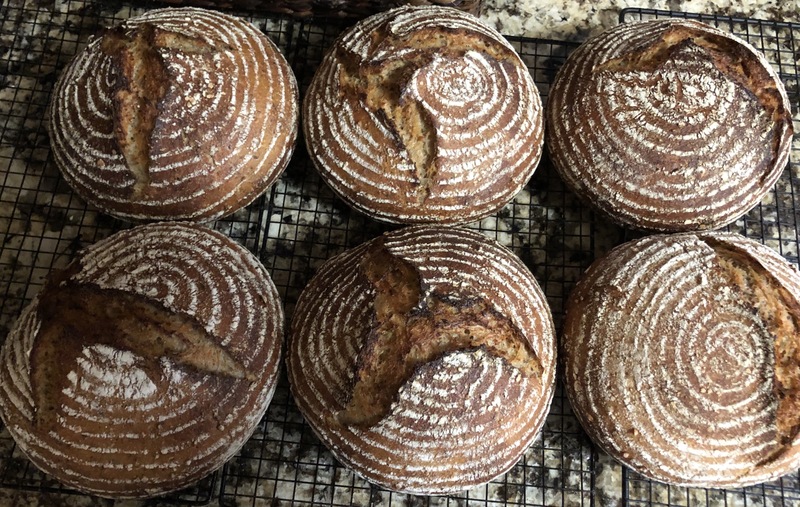 Admittedly I haven't baked a bunch with it yet, but of the bakes I've used it for they really seemed to have risen much better with it during bulk - as has my starter development. I think it will help me with consistency - especially in the winter. 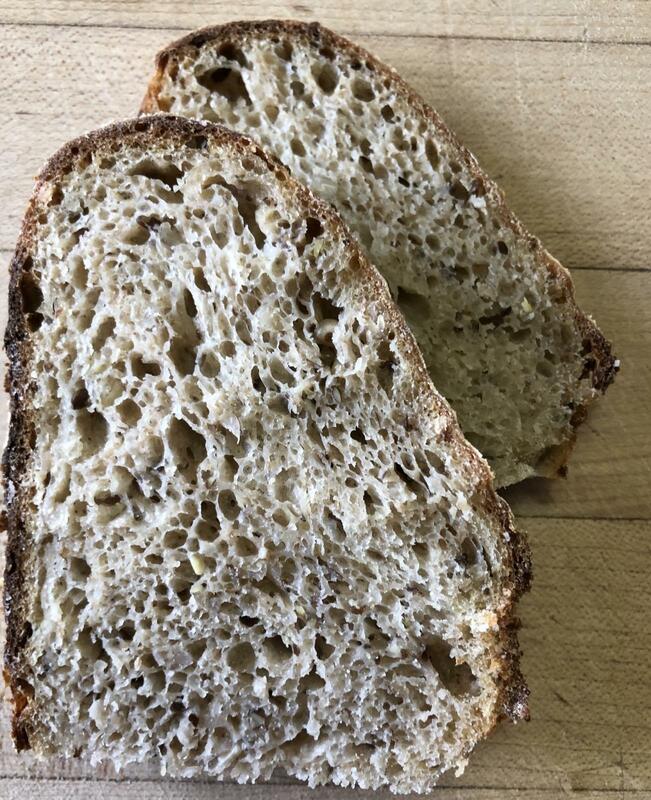 I'm not sure how it's going to go in the middle of a warm summer, and assume I wont' use it then but I'll see.. As to Tartine/Chad, I think his recipes are among the best I've ever made. As to this bake, your bread looks predictably amazing.. aren't you bored of being so good so often!? :) And let me know if you deliver Fedex overnight to Toronto.. :) Be good, frank! Its about half of the cost of the grains but I try to buy when they have their 20% off sale and that helps a bit. I do one order for the year. No I don’t get my Unbleached flour from there. I used to buy Rogers no additives Unbleached flour from Safeway but I discovered Keynote Strong Bakers Unbleached flour at Wholesale Club. The price is just a bit more than half of the Rogers flour and it preforms just as well. Maybe I'll see what Costco carries.. LOVE the crumb!